I’m so thrilled to introduce you to this month’s guest blogger. I’m inspired by her and all of the incredible desserts and baked goods she makes and posts on her blog, Baking For Friends. I met Alex at a conference last year in Chicago – I can’t believe it’s already been a year! The event was an overwhelmingly positive experience for so many reasons; I learned a lot and forged some of the most incredible friendships there, whom I’m still in touch with today including Alex! What I love about Alex is her go-getter attitude and friendly demeanor. She’s a true beauty, inside and out. This recipe is unique to me because I haven’t made candy up until this point. It was such an easy recipe to follow and the result was a fragrant, delicious brittle that accompanied my tea perfectly. 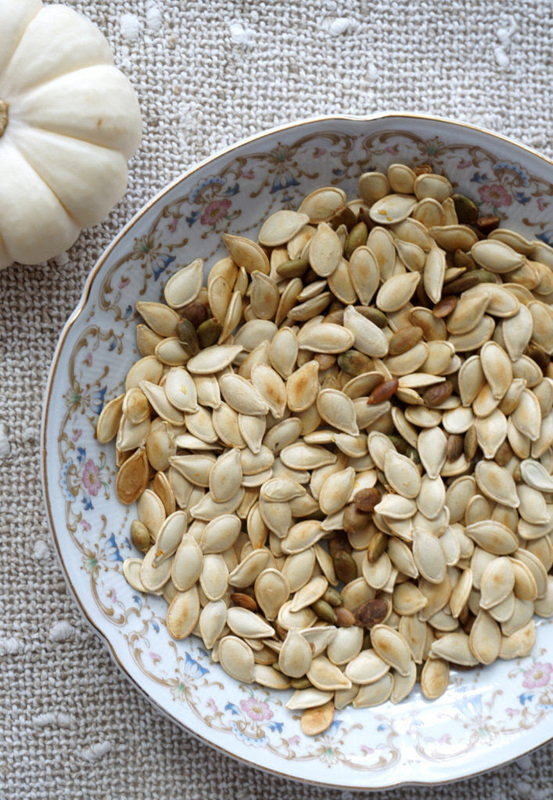 Among their many benefits, pumpkin seeds are rich in minerals, high in magnesium, and have anti-inflammatory properties. So, although this is a sugary based treat, the fact that it has all of these positives balances everything out. 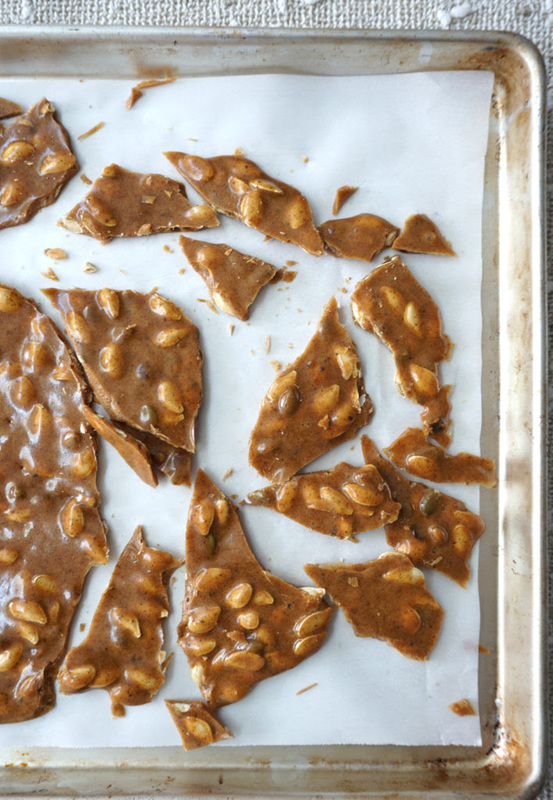 Go ahead and make this delicious Pumpkin Spice Brittle! And thank you Alex for contributing to No Dairy No Cry! Around this time last year I was flying to Chicago to attend my first food bloggers Conference! During my stay I met bloggers and food advocates from all over with a deep (and familiar) passion for food! There were food bloggers from all different niches – health/fitness, vegetarian, youtubers, cooks and like myself, bakers. Out of the hundreds of people there, one blogger stood out the most to me; Laila from No Dairy, No Cry! Laila has an allergy free food blog that was inspired when she discovered that both her children suffered from severe food allergies. That in turn, turned her and her families life upside down! Hearing Laila speak at the conference about her concerns and her passion for feeding her family (with good tasting alternatives) and wanting to help others like her hit a soft spot in my heart! So when Laila asked me to feature a recipe here on her Blog No Dairy, No Cry I have to say I am nothing but honoured! Although I do have to say Laila is the much stronger cook/baker when it comes to cooking or baking allergy free food, but I thought I’d give it a shot! 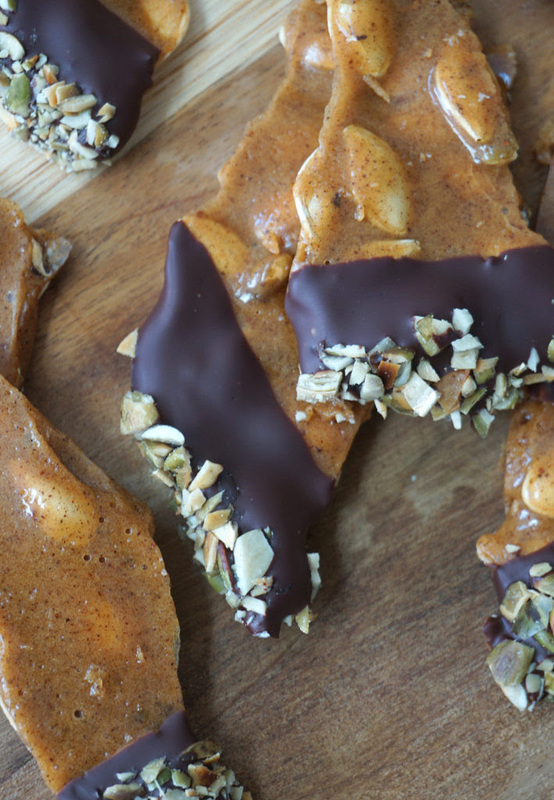 I hope you all enjoy my pumpkin spice brittle recipe and find it becomes an autumn staple at this time of year! Click here to get Laila’s allergy free version of my Chocolate Cupcake Recipe and to read more about Laila featured on my blog. 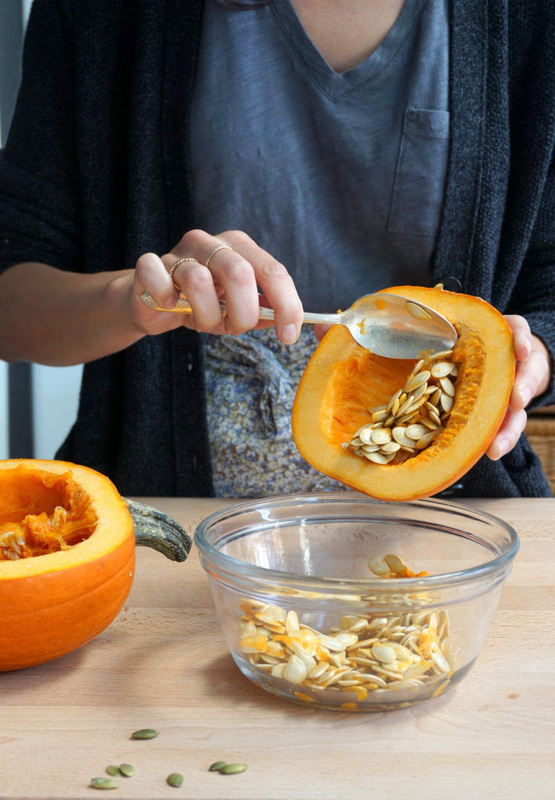 Using a baking pumpkin, cut in half and scrape out seeds. Rinse and clean seeds. In a frying pan toast seeds on medium-high heat with a pinch of sea salt. Stir until golden brown and seeds start to smell fragrant. Set toasted seeds aside. (Note if you don’t have enough pumpkin seeds from your pumpkin add Pipits seeds (shelled pumpkin seeds, green in colour bought from the bulk food store, be careful when adding them to the frying pan as they toast much faster than the raw seeds from your pumpkin). Prepare a baking sheet with parchment paper and set aside. In a medium saucepan heat water, sugar and corn syrup over medium high heat stirring constantly with a wooden spoon until it starts to boil. Once the mixture boils stop stirring and let the mixture boil until it reaches 285 degrees (this is where you will need a candy thermometer). You may have to turn the heat up to high if the temperature isn’t increasing. Now stir in your toasted pumpkin seeds, heat until the temperature reaches 300 degrees. Turn off the heat and add your spices, baking soda, vanilla and butter (the mixture will bubble up), stir together. Working quickly, pour out your brittle on to your prepared pan and spread as thin as possible. You can bang the pan on the counter to get rid of any air bubbles. Place in the fridge for approx. 30 minutes until hard. Once the brittle is hard, break into small pieces. 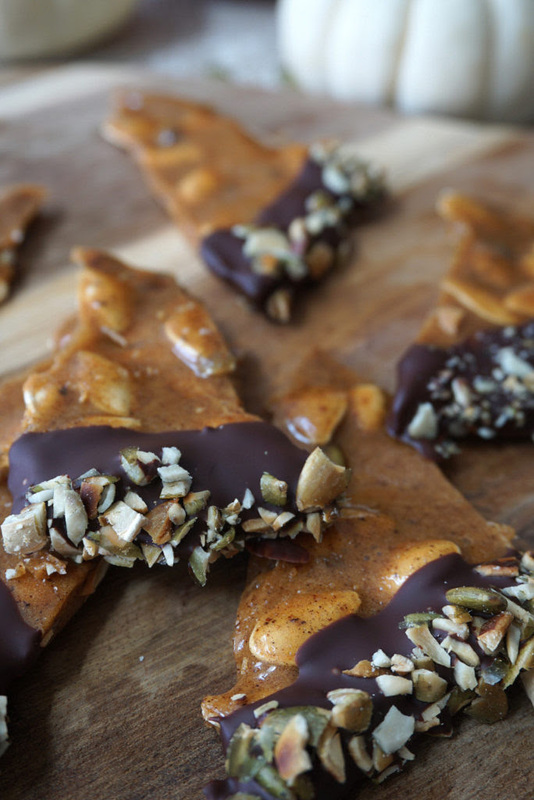 Optional – Dip brittle into melted chocolate and chopped pumpkin seeds. This sounds simply amazing!! PINNING! What a delicious flavor idea for brittle. It looks even better than classic brittle. I love making pumpkin seeds into brittle, never thought to dip it in chocolate though. I bet that makes it delicious! This looks so yummy! The chocolate is a nice addition! Thanks, Amanda! The chocolate is definitely a recommended addition – it heightens the flavor of the brittle!